Food is meant to be used as a tool to promote vitality, energy, medicine, and overall health. As a holistic nutritionist, I believe in giving my body nourishing whole foods – that means foods that are unprocessed and often can’t be found in a box. But aside from questions about what foods to eat to gain energy, lose belly fat, and promote weight loss, one of the things I get asked most often is whether I get cravings for things that aren’t technically considered health foods. The short answer: yes, I get food cravings too. My personal food vice? Cookies. Chocolate chip and walnut cookies to be exact. Put a warm chocolate chip and walnut cookie in front of me, and you bet I’m going to be tempted to stuff it in my mouth. I’m not one to promote constantly ignoring your cravings, though. Sometimes you need something salty, sweet, or both, and that’s OK! I always tell my clients that it’s the ingredients that matter more than the actual craving. You can eat something that’s extremely satisfying but also has some health benefits. Whenever possible, when you’re hit with a craving, get in the kitchen and start baking or cooking away. The ingredients you’re going to use are going to be much healthier, and honestly taste even better. Stay away from ingredients like white flour and sugar and use alternatives like spelt flour, almond flour, flaxseed meal, nut butters, honey, and pure maple syrup for baked goods, and choose whole-food ingredients in your cooking. Let’s be real, though: you don’t always have the time (or honestly, the desire) to head to the kitchen when cravings strike. I recommend keeping a list of healthy grocery store treats that are premade and not just from the produce section. Look for items that have the fewest, most recognizable ingredients, and choose organic whenever possible. Stay away from white carbs and sugar, and go for items most similar to what you’d make in your own kitchen. But let’s say you’re at a bakery, restaurant, or cafe. That’s when it gets harder, especially if the menu features your favorite vice. 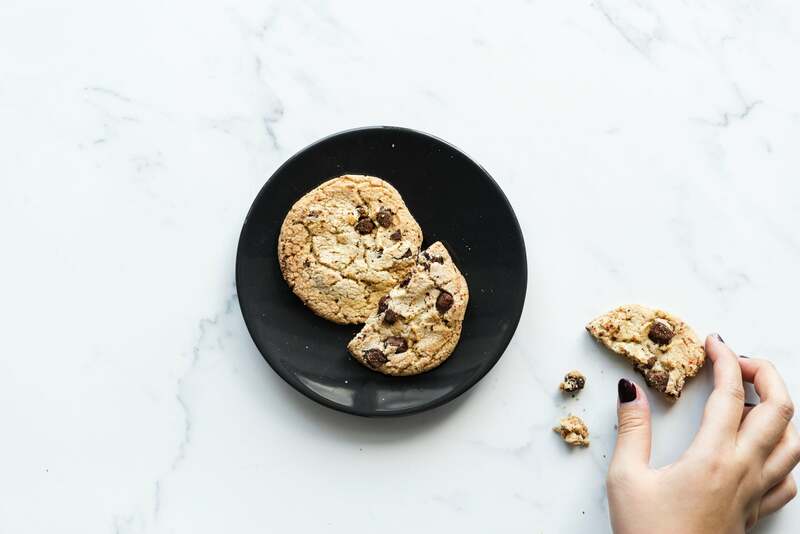 The good news is that after cooking your own healthy treats for long enough, you’ll notice your taste buds changing to the point that when you eat pre-packaged or processed cookies, for example, they taste too sweet. But if that’s not the case, and a bakery strikes the perfect balance with your favorite treat, you may have to just give in and eat it in its entirety. Sometimes you just gotta live a little, you know?